One of the toughest lessons that I had to learn the hard way is the importance of quarantining new fish before adding them to your set-up. When I was starting out in this hobby I did not use a quarantine tank and I was lucky for a quite a few years. But then my luck ran out and I had a whole tank wiped out by adding one little fish that was carrying a disease but did not show any symptoms. That was when I started learning how to quarantine fish and actuating following a quarantine process. Based on what I have read, having a tank’s complete stocking wiped out by a disease introduced from a new fish has driven more people out of the hobby than anything else. The good news is this is completely avoidable when you follow a quarantine process. The below thread in our forum also highlights the importance if you still think it could not happen to you. Based on everything that I have read and experienced in my time in the hobby, there are many reasons why you would want to use a good QT process. The below list contains just a few of them. QT tanks are not only for treating diseases. Give the fish a chance to recover from any condition or disease. Get the new fish on the right foods and nutrients, not all stores feed the best foods and most wild caught fish need to learn to frozen and prepared foods. Safely treat any disease that your new fish might be carrying without have to worry about harming other tank inhabitants, corals, or your beneficial bacteria. If you had fish, inverts, or corals shipped to you, a QT tank will help your new additions recover from the stress of shipping a lot better than in your main tank were they would likely have to compete for food or maybe even get harassed by their tank mates. 1) It’s too expensive. I’ve heard this one al lot. There is nothing cheap about this hobby. But if you don’t do it right from the start it will cost you a lot more in the end for correcting the problems later as opposed to avoiding them in the first place. 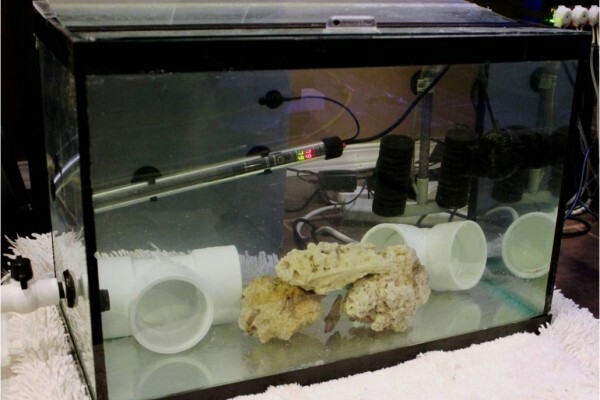 Quarantine tanks don’t need to be expensive or elaborate set-ups. A simple but effective set-up is all anyone requires. 2) It’s too hard on the fish. While having the extra time in another tank before going into your main tank can add some extra stress for the fish, in the long term, being able to quickly and effectively treat that fish for any disease will help to ensure it thrives over time. Any potential stress of being I a QT tank is only temporary and can easily be minimized. 3) My local fish store is great. That is all well and good, but what do you know about their suppliers? No matter how good a local fish store is, you cannot trust their fish to be disease free. Some symptoms can take time to become apparent so you may not be able to notice it in the store. IMO, the marine fish store in the city that I live in is about the best I have ever been to. But I still QT all the fish I purchase from him as the early stages of some disease and infections can be extremely difficult to notice even for some of the advanced hobbyists. 4) I don’t have a spare tank. I once used a $8.00 rubber maid container as a QT tank for 3 weeks. It worked surprisingly well. You just have to be careful to make sure the heater will not touch (or come close) to any part of the container or it will likely melt it. Garage sales have been an excellent spot for me to pick up a cheap and old used tank that has some scratches and most people do not want to have as a display tank. It doesn’t have to be pretty. 5) It makes no sense to have all that QT equipment sitting around not in use, waiting for you to get new fish. You could have to treat fish at any time. Fish can develop problems resulting from injuries they get while in your care. Have a QT tank and equipment ready to use allows you to react quickly. 6) Fish can get ick anytime they are stressed enough so a QT process will not change that. IMO, that is a false belief as there are no amounts of stress that can make a virus appear out of nowhere. It’s either there, or it’s not, stress can only accelerate it and wear down the fish’s immune system to it. Although ick can remain dormant in your rocks and/or substrate for a period of months, it will not appear for any reason beyond that period of time unless it is introduced into the set-up. A proper sized tank. This can really depend on the size of the fish to be quarantined. As most of the fish that we buy at local fish stores are smaller and younger fish, a 10 to 20 gallon tank will likely do just fine in these cases. If you are purchasing larger fish like some adult tangs, you may need a larger tank such as a 30 or 40 gallon tank. This tank should also have some type of lid/top to it to prevent any fish from jumping out of the tank. Filtration. This is critical in order or any QT process to work effectively. You will need a fully cycled filter. The easiest (and likely the best way) is to keep a sponge filter running on your main tank that you can just transfer over to the QT tank when needed. The sponge filter should be running on the main tank for about 3 to 4 weeks before being ready (becoming seeded with beneficial bacteria) to be used in your QT tank. I have had the best luck using this process for my marine tanks. I also like using sponge filters as the extra oxygenation from the bubbler will help to keep the PH more stable. Your standard test kits for ammonia, nitrite, nitrate, and PH. This is pretty standard equipment that all hobbyist should already have. You need to keep a close eye on your parameters, especially when you are using medications that can affect your beneficial bacteria. A refactometer for testing salinity. I have never been a big fan of using hydrometers with the plastic swing arms as I have found them to be very inaccurate. Some treatments require a specific salinity so it is best to have a refactometer to use. Just enough lighting for your fish to find its food. Lower levels of lighting (at least in the beginning) are likely better in the first place as this will help the new fish to adjust to the tank. 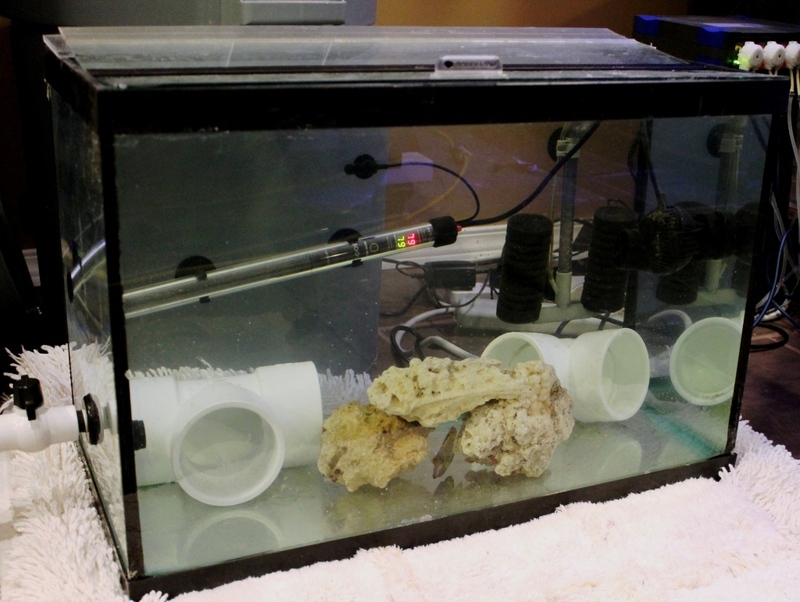 If you are quarantining corals, then you would need to have suitable lighting for their requirements. For some corals and inverts, if the lighting in the QT tank is not quite up to the minimum requirements, you can compensate for that during this period of time through extra feedings. Some decorations similar to your main tank to help the fish adapt after you transfer it to the main tank. It would also be good to provide some hiding spots as well to help you fish feel safe. I only use PVC fittings in my QT tanks to ensure I have nothing in there that could soak up any meds. A appropriate sized powerhead for some gentile water movement. Some medications describe later on in this article, or at least easy access to get them quickly. Below is a picture of the sponge filter that I keep running in one of my sumps. This will keep it seeded/cycled ready for use at any time. 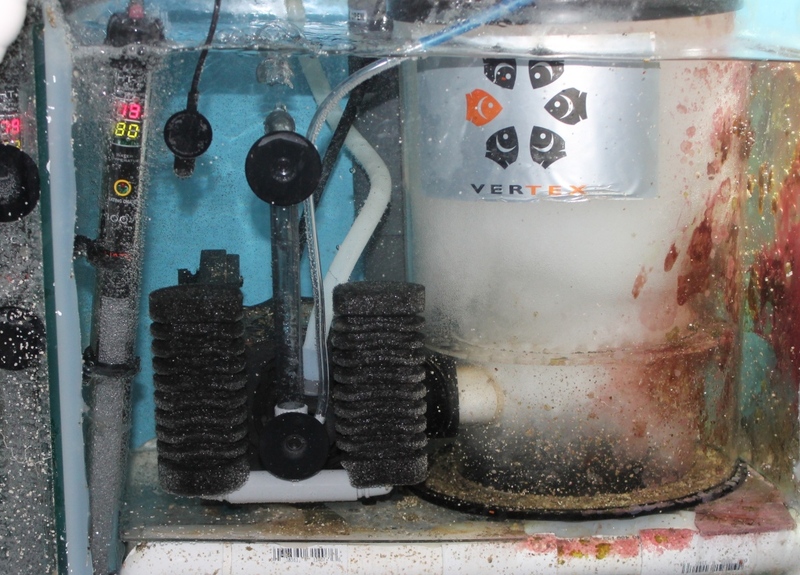 Ensure all equipment is washed and cleaned (except for the sponge filter) before setting up the QT tank. Place the filter and all equipment in the tank. Set it up and turn it on. Keep the salinity, temperature, and PH the same as your main tank for the while time you have fish in the tank. If the fish going in the QT tank is a sand sifting fish, add a bowl / small tray of silica sand to the bottom of the tank. Drip accumulate the new fish to the QT tank just as you would for any fish. The below links can also help explain that process. The same process for FW is also effective for marine set-ups. 8. Add the fish to the QT set-up and closely watch him. I would suggest to never use live rock as filtration in a QT tank. Live rock can soak-up and hold medicines just like a big sponge and then latter leach them out into the water. As most medicines are not reef tank safe, these rock should never be placed in your main tank set-up again regardless of how well you clean them afterwards. Add any de-wormers or other food additives you may want to use on the fish food you will be using. I would recommend using vitamin additive to the fish food. This can help build up the fish’s immune system and overall health before being added to the main tank. Remove any un-eaten food a short while after feeding. You fish can take up to a week before it feels comfortable enough to have a strong appetite. Additionally, if the fish is wild caught, it may take some time for it to eat frozen and/or flake foods. Having some uneaten food on the bottom of the tank is normal, but you still need to remove it so it will not affect your water quality. Complete 20 to 50% (or more depending on the parameters) weekly water changes with old tank water from your main tank. You need to make sure you have 0 ammonia and nitrite in the water and the nitrates to not get too much higher than what you maintain them in your main tank. Follow the water changing instructions on any meds when they are being used. The below is an example of a QT tank that I set-up for a new fish. I also have some pretty non porous rock (dead rock) that I will sometimes use for decoration only. This rock will never see a main tank and will get a fresh water soak after each use. The below links can help you identify any potential disease in you fish a lot better than I can.. If you are in the same situation as me, having only one marine fish store in town which is closed two days a week, you might want to keep some medications on hand to treat the more common problems. If you have access to a store that would carry these and be open at least 6 days a week, I would not bother to keep any meds on hand. So far I have been very fortunate and only had to treat fish for parasites (not ick). I only have firsthand experience using Paraguard and PraziePro with my marine fish. I have found both to be very effective when used following the manufacturer’s instructions. The fish responded positively and quickly to the treatment without any effects on the beneficial bacteria in the sponge filter. I am now in the habit of applying a single preventative dose of Paraguard when adding fish to my QT tank. Paraguard: This too is a preferred medication that I have used. This is a very good treatment options for parasites, fungus, and infections. A very safe medication to use as well. Stress Guard: This will help to repair or replace the fish’s mucous coating from damage that can sometimes occur when they are netted out of the holding tanks, or damage due to other injuries or diseases. Maracyn Two: This is used to treat many different types of bacterial infections. As this has a shelf life to consider, you have to be careful to make sure the amount you keep on hand is not expired. Cupramine: This is one of the best copper treatment medications. This can be used to treat either marine inch or marine velvet. This even can be used on the more sensitive marine fish and can be effective in half doses. DO not use any copper based meds if you have any inverts in your QT tank. I have founf this medication to be very effective when treating ick. Most people have very good luck with a 3 to 4 week period of problem free time in the QT tank. If the fish shows no signs of any sickness after 3 to 4 weeks, then they are ready to be transferred into your main tank. If your fish did show signs of a disease which you had treated, then the 3 to 4 week window would start after the treatment was finished and the fish appeared to be in good health. This length of time has always worked well for me after I administer a preventive dose of Paraguard to ensure the fish is parasite free. If you are going to use the QT tank in the near future, you can keep it set-up and running by adding a few drops of pure liquid ammonia daily or adding some small amounts of frozen food each day. When you need to use it again, just complete a 100% water change with water from the main tank before adding your fish. If you did not add many meds, you can return your sponge filter to the main tank after a really good cleaning in old tank water from the main tank. 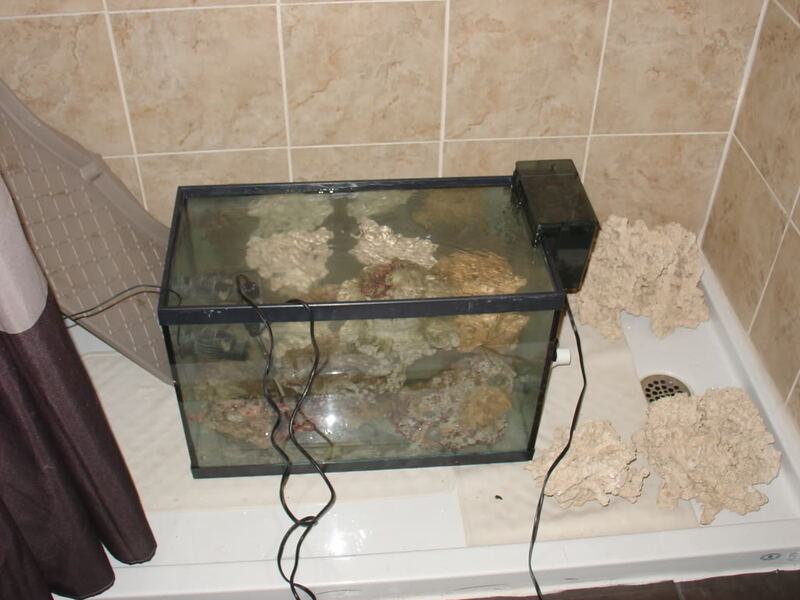 If you did use meds it would be best to dispose of the sponge and place it with a new one in the main tank. Wash all equipment with warm tap water but no soap or cleaners of any kind. Never return anything to your main tank if copper based meds were used in any treatments in your QT tank. This would include the decorations and the container of substrate if one was used. Don’t use products in a QT tank that claim to instantly cycle a tank. Only Mother Nature can do that for you. Make sure you always use a ready to go and cycled filter. You cannot short cut this. Don’t use live rock for filtration in the QT tank. Meds will get into (and stay in) the rock and be transferred into your main tank. Once a rock has been exposed to meds it should never again be placed in a display tank. Don’t place too many fish at once in your QT tank. Your biological filtration may not be able to keep up with a larger stocking at once, and you don’t want to treat a lot of fish if only one of them is sick. I have personally never had more than three small/young fish in my 20 gallon QT tank. What About my Live Rock? I will always QT my live rock before using it in a set-up. I will use the curing process for this. Live rock can carry many different parasites that can also infect your fish, like the ick parasite, which can remain dormant for a period of time without a host. TAdditional, live rock can also host a wide range of hitch hikers that you do not want in your tank such as certain ISO pods that can infect/attack your fish or certain types of coral eating nudibranches. There are also a wide range of “pest” like problem that can be transferred by live rock such as parasitic snails, aiptasia, or flat worms. When setting up my 90 gallon reef tank I did make the mistake of not QT my live rock and cycling it / curing it outside of my main tank. As a result I had the “pleasure” of dealing with flat worms, aiptasia, and some snails which prevented me from keeping clams. To this day, I still find the odd aiptasia and some flat worms from time to time that I have to deal with so I don’t get a big problem on my hands. All of which could have been avoided. When setting up my 120 gallon reef tank, I did QT my live rock and cured it for about 4 weeks before adding it to my set-up with a single problem to date. The below link will provide you with some more details on curing live rock. Following the process in the above link should be enough to kill-off any bad hitchhikers as well as most parasites and bacteria that could be in your rock. The longer you qt / cure the rock, the better it will be. Just remember the longer you QT your rock for, the more important it becomes to add a little bit of ammonia to the water to keep the beneficial bacteria alive. I’ve had as much as around 60 lbs of live rock in my 20 gallon QT tank before. Adding around 5 or 6 drops of ammonia each day was enough to keep it alive. Below is a picture of the live rock that I cured for my 120 gallon set-up. As I only had one spare powerhead at that time, I used an empty hang-on-back filter to create more flow. This is one topic that can start a lot of debate. Corals can carry bacteria that can be spread to other corals which can wipe out most (if not all) corals in your tank. Although I have only done this once this in the past, from now on I will QT corals for at least one week. IMO that length of time should be enough to be able to tell if there is a problem with the coral. Some people will argue that you only need to use a good quality coral dip to rid the coral of hitchhikers along with bacteria and parasites. As that was typically what I have done in the past, I now believe that I was lucky. I know my luck will run out if I don’t QT new corals, at least that is what I have learned from reading about the hardship of others. I have used the below coral dip for quite some time now and it is one example of a good coral dip product. Your corals should be dipped before placing them into the QT tank. The below link will provide you with some coral disease information that can better help you understand what to watch for in your corals. Quarantining your new additions is not fun or easy, but you will be rewarded for these efforts with a disease free tank and years of enjoyment. IMO, you simply can not short cut or not follow some type of QT process with running into some problems latter on. Please feel free to start a thread in the forum to ask any questions you may have. If you are not already a member, you will need to sign-up first. The link above that connects to the forums to outline the steps to cure live rock is invalid. Can you direct me to the correct thread? Thanks! They all work for me, save the curing live rock link. When I select that link, it takes me to the forums but gives an error stating “Invalid Thread specified…” I will try to find the post by searching the forums. How should I return my fish after applying cupramine to my quarantine tank?